"I think there should be a rule that everyone in the world should get a standing ovation at least once in their lives," says August Pullman, the main character in Wonder, and RJ Palacio certainly deserves hers for this bittersweet but ultimately uplifting novel about a severely disfigured boy. Wonder appears to be aimed at kids of perhaps ten upwards, but it's an equally engaging and moving read for an adult and I thoroughly enjoyed it. We all know that starting a new school at all is hard enough as it is, but things are doubly difficult for Auggie, whose facial disfigurement is so significant that he is fully accustomed to people visibly recoiling when they meet him for the first time, even if they think they're hiding their reaction. As we follow him through his first year, Auggie is self-deprecating, quietly determined and, like most children of his age, an amusing and sometimes poignant mix of naive and astute. It's impossible not to root for him. However, a major strength of wonder is the introduction of perspectives other than Auggie's in the narrative. Wonder is among other things a book about how we perceive others, so it's only fitting that we hear not just from Auggie himself but from those around him. The sections narrated by Auggie's teenage sister Olivia, who is fiercely protective of her younger brother and yet at the same time acutely aware that his unique needs mean she will always play second fiddle, are particularly enlightening, but every voice struck me as vivid and authentic. The toughest challenges Auggie has to overcome are related to his appearance, of course - but anyone who can remember being eleven will be familiar with typical anxieties like their first overnight school trip, mysteriously shifting social cliques and peer pressure to grow up too soon, and there is much in Wonder that any reader can identify with. 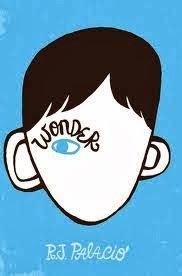 If I have a criticism of Wonder it's that there are times when Auggie's parents seem a little too understanding, a little too indulgent, even, to be true, and I would have liked to see a little more complexity in their characters. It's also fair to say that Wonder isn't particularly plot-driven. But it's a lovely, oddly life-affirming read that reminds us of some simple but vital truths, good and bad, about human nature, and although there a couple of heartbreaking chapters, I'd defy anyone not to finish this book smiling.